Marqués de Carrión Winery is located in Labastida, an historic village in Rioja Alavesa, covered by the Cantabria mountain range, at the bank of the river Ebro, 4 km far from Haro. The winery has 35,000 m2 (15.000m2 build-up) with an elaboration bottled capacity of 50 million per year. Nowadays, it has 20,000 American and French oak where the wines rest before bottled and its rest in them. 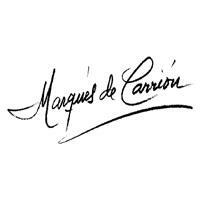 The bottle cellar of Marqués de Carrión has a capacity of 1 million of bottles dedicated to Reservas and Gran Reserva. The quality of the grapes harvested in our vineyards in the town of Laguardia, a privileged area of the D.O.Ca Rioja for the high quality of its vineyards, joined to the carefully elaboration of the wine gets that our produced wines in Marqués de Carrión are the most valued and sought. The winery is also a meeting place of tradition and avant-garde art of Jull Dziamski, an internationally renowned artist that has decorated all the insides of the winery, counting as well with the museum that is named "Museum of the Illusions" that keeps the paintings and the sculptures more representative of the artist. Besides the permanent exposition of Jull art in the museum, periodically, the winery housed cultural events of art, wine tastings and gastronomy events. Like the rest of the wineries of García Carrión, these installations obey all the international standards of quality assurance of the ISO and IFS. The wines of the winery Marqués de Carrión, Antaño, Solar de Carrión and Montequinto, that have been awarded in the last years with international and national prestigious awards. James Suckling 92 "A red with lots of floral, dried fruits, and hints of lavender. Full-bodied, very structured and powerful. Loads of fruit, and shows tension and form. Drink or hold. Impressive." Wine Advocate 88"The 2008 Reserva seems like a much more serious wine, with fresh notes of cherries, some leather and pepper and a tight palate that reveals good balance, purity of flavors and good length. It should age well, as it has good balance. Drink 2014-2019."